Over the years, I have always tried to come up with original ideas for Bunco Theme parties. Some have been successful, some not so much! 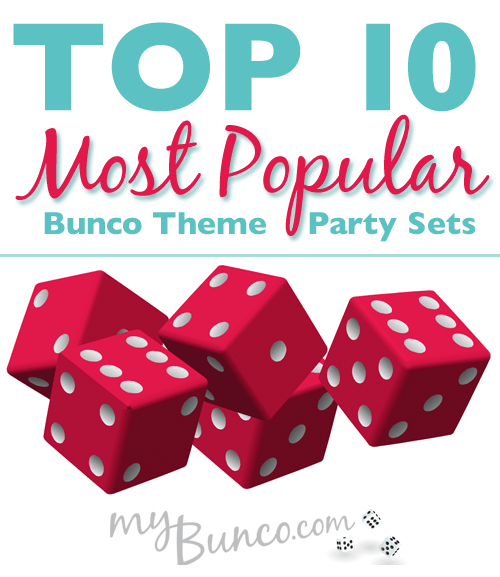 I thought I would sit down as compile a list as of now (September 2015) of my top 10 most popular Bunco theme party sets. This list is based on sales numbers through my Etsy store. Let the countdown begin! Once I started to compile this list, I realized that holidays are some of the most popular theme ideas for Bunco parties. My St. Patricks Day Bunco Theme comes as a standard Bunco Printable set as well as a Deluxe Bunco Printable set. This is a great theme for your March Bunco Party! 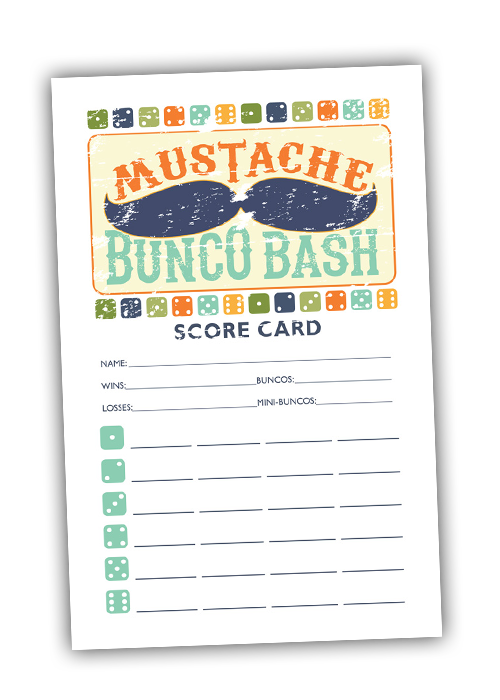 Like #10, the Mustache Bunco Bash comes as a standard Bunco Printable set as well as a Deluxe Bunco Printable set. This is a great set for any time of year, and combines whimsy and fun. The Mustache Bunco Bash theme is for the Bunco group that has done it all! Viva Las Vegas! Let loose and let the good times roll with this Las Vegas Bunco Theme Set. The scorecard reads “Welcome to Fabulous BUNCO night!” in the style of the famous Las Vegas neon sign. Of all of the Bunco Sets on this list, this one surprised me a bit. When I designed this, it was 100% for me and me alone! But time has shown that an 80s Bunco Theme Party is a popular item. So bust out the Aqua Net and shoulder pads, this theme is like, totally rad. The Holidays are a great time to host a bunco party and show the people that you love how much you mean to them. This simple Christmas Bunco set is a hot item in December and January. Who doesn’t like a margarita? Cinco De Mayo Bunco is a great May bunco theme. Pair it with great Mexican food. You don’t have to wait for May 5th to host this party, we also offer a Bunco Fiesta theme. Bust out the gras skirts and drinks with umbrellas. A Bunco Luau theme is great in the heat of summer or in colder months when you wish you were on a beach in Hawaii. “I think my drinking night has a bunco problem…” It says it all. This humorous Retro Housewife Bunco Set is a top seller. Be sure to check out my Retro Housewife Party inspiration board for this set! This one is a classic. The Zebra and Hot Pink set is great for your Bunco Babes. This set comes as a basic bunco set and a deluxe party set. Also, this set has a FREE matching printable us/them tally sheet. Keep Calm and Play Bunco! This is my oldest bunco set and that may have something to do with it’s popularity. This great set a basic bunco set and a deluxe party set. Also, this set has a FREE matching printable us/them tally sheet.